This is the beginning of a series of articles on IPA variants. For the near future, I’ll post one article per week covering one variation on the IPA theme. I will discuss rye IPA, Belgian IPA, wheat IPA, session IPA, IPL (India pale lager) and white IPA. 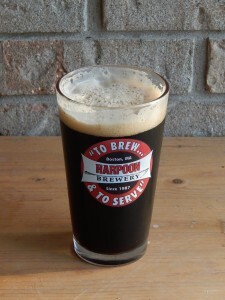 This weekend, I’ll kick things off by posting two articles on “black IPA.” The first will cover IPAs with some color, but little or no roast character. The second will cover dark IPAs with a fair amount of roasted malt flavor and aroma. It’s a Northern Bastropian American Indian-(Not to be Confused with Native American)-via-British Currently Melanoidin Positive (but Historically Pale) Ale . . . and I was the first person ever to think of putting hops in a dark beer. That’s my story and I’m sticking to it. Black IPAs have been popular for the past few years, and in the following two articles, I’ll give a quick primer on brewing beers like this. This barleywine will definitely take the chill off. 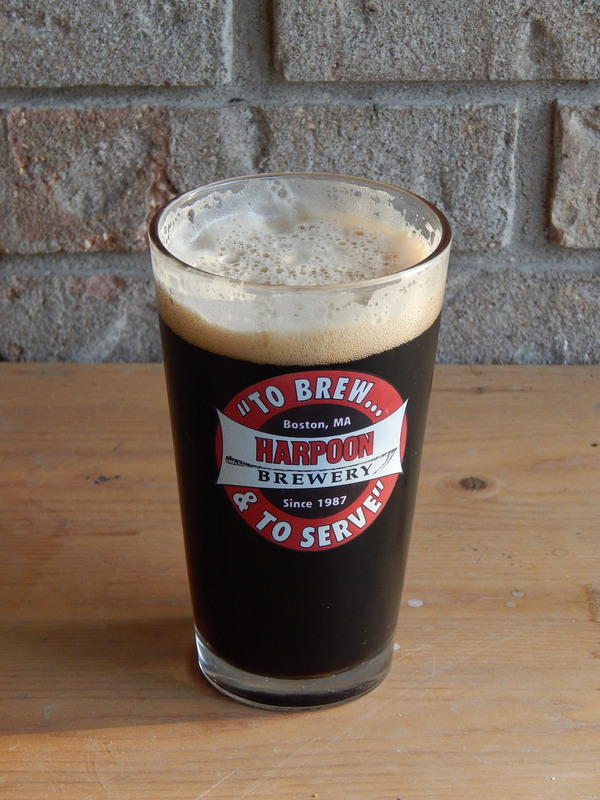 Read about how this beer was brewed along with the recipe here. If you’re looking for subtlety, look elsewhere. This barleywine with ingredients typically found in a fruitcake is big and full of flavors. The first sip tastes like . . . well . . . fruitcake – or maybe a spiced cake that would be at home at Grandma’s house. It’s hard for me to pick out the individual spices because they blend together well. But, there’s a lot of them. Following up closely behind the spice attack is subtle pineapple from the candied fruit added close to the end of the boil. It is well balanced with the rest of the beer. As the beer warms – and weighing in at nearly 12% alcohol by volume, it should have plenty of time to warm – darker flavor notes come from the brown sugar and molasses undertones. The beer finished at a gravity of 1.013, so the mouthfeel is fairly substantial. There is no alcohol hotness. Unfortunately, the carbonation is nearly nonexistent. I probably should have added some fresh dry yeast at bottling time to provide reinforcements for the Safale US 05. If this beer performs as a previous batch, it should age well. Time should mellow the spice character as the malt and dark sugar flavors deepen. I’m looking forward to next holiday season . . . if I can save a few bottles until then. 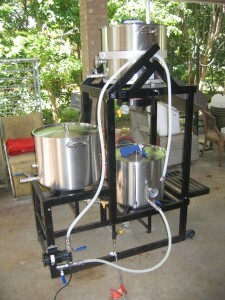 A 3-gallon (11-L) brewery set up capable of brewing all-grain beer up to an OG of 1.048 or partial mash beer at any OG. Bigger is better, right? As I pointed out in a previous article about scaling your batch size up or down to fit your needs, smaller is sometimes the way to go. (And if it isn’t, see my article on scaling up.) For apartment dwellers, scaling down from 5.0 gallon (19 L) batches might be beneficial due to space limitations. Brewing smaller batches can also be a good idea when brewing an experimental beer, or a beer style you’re not sure if you’re going to like. For example, if you’ve never tried a smoked beer before, but are curious, it may be better to generate a couple gallons of the beer rather than the usual 5.0 gallons (19L). Beer with expensive ingredients or very large grain bills are also good candidates for a smaller-sized batches. And of course, if you like to brew more than you like to drink, and the beer is piling up, scaling down may yield a more manageable beer inventory. How Much Beer Are We Talking About? In this article, I’ll discuss the ins and outs of making batches of homebrew in the 2.0-gallon (7.6-L) to 3.0-gallon (11-L) range. Three gallons (11 L) of beer will yield thirty-two 12-oz. (355 mL) bottles of beer. That’s a case, a six pack, and two more bottles. Compare that to the fifty-three bottles — just over two cases — that a 5.0-gallon (19-L) batch generates. For 2.5 gallons (9.5 L), the yield is 26 bottles, two bottles more than a case. Two gallons (7.6-L) yields twenty-one bottles,three bottles short of a case. Brewing this volume will take roughly the same amount of time as brewing 5 gallons (19 L), although your heating and cooling times may be shorter. Shiny. My 10-gallon (38-L) brewing rig — a tippy dump sculpture made by MoreBeer. The three vessels — HLT, mash/lauter tun, and kettle — are made from 15-gallon (57-L) stainless steel pots. More beer! Homebrewers who’ve been at it for a few years often heed this call and scale up from 5 gallons (19 L) to 10 gallons (38 L) or more. The fundamentals of brewing beer don’t change no matter what scale you’re brewing at. In addition, scaling from 5 gallons (19 L) to 10 gallons (38 L) requires no new skills — you just need a bigger set of vessels than your 5-gallon (19-L) brewery. Scaling up to 10 gallons (around 40 L) has one big benefit — you yield twice the volume of beer while your brewday is roughly the same length. Depending on your equipment, it may take slightly longer to heat your water or chill your wort. However, with a brewery designed to to make 10 gallons (38 L) of wort per batch, the time spent brewing will be equivalent to brewing 5 gallons (19 L). There are a few incidental benefits to scaling up. For instance, your mash volume is going to be larger, and consequently have a smaller surface-to-volume ratio. As such, it will require less insulation or periodic heating to keep the mash temperature steady. On the other hand, there are some minor drawbacks that come with size. You’ll use more energy (likely in the form of propane) for heating water and wort, and you’ll use more water chilling the wort. However, the biggest drawback is that there is not as much inexpensive equipment that can be repurposed for brewing at this scale. 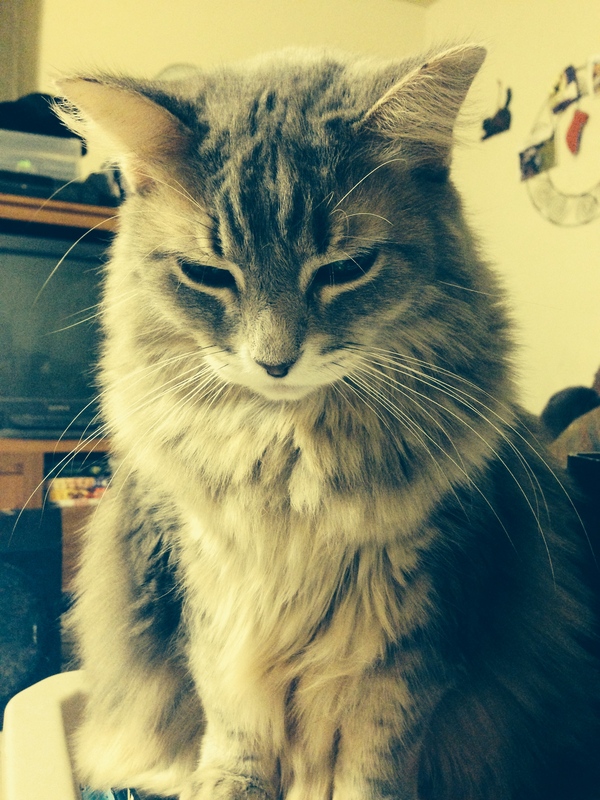 For no apparent reason, here’s a picture of a cat. My name’s Michael. I’m a homebrewer originally from Austin but living far, far away. I hear you a bunch on Basic Brewing Radio and I read your article “Expand Your Output” and I had a quick question for the expert in diluting high gravity beers. I brew BIAB and I made a “super saison” and I didn’t get too much wort (only 13 L) because I made a smaller beer out of the second runnings. I’d like to boil my priming sugar in 3 L of water, so I can bring my ABV down to the target 9%. The beer has ~50 IBUs and will need at least 3 months of conditioning. Will I ruin this beer by diluting it? A 3-gallon (11-L), 5-gallon (19-L) and 10-gallon (38-L) soda keg. Most homebrewers brew 5 gallons (19 L) at a time. The vast majority of homebrew recipes are written for this size and 5-gallon (19-L) batches are the de facto standard for homebrewing. However, there’s nothing magical about 5 gallons (19 L). You can brew more or less beer if it fits your situation. 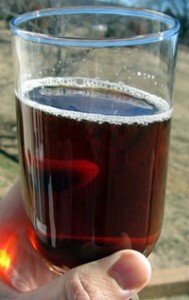 The 5-gallon (19-L) batch size is popular because a variety of items can be repurposed for brewing batches of this size. 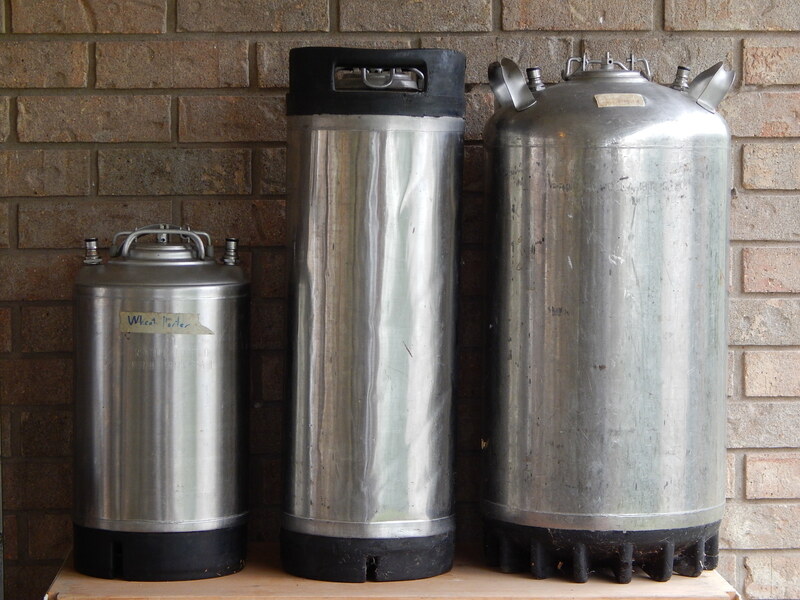 Five to 6.5 gallon (19–25 L) carboys and 5.0-gallon (19-L) soda kegs are the two most obvious examples. Also, it produces an amount of beer — a little over two standard cases (of twenty-four 12-fluid-oz. (355 mL) bottles) — that most homebrewers feel is worth the effort. However, depending on how often you brew, the space you can dedicate to brewing and storing beer, and how much beer you want to have on hand at any given time, you can scale your homebrewing up or down. Over the past two weeks, I’ve posted several previously posted recipes reformulated as countertop partial mash recipes. These were: The Cure from Cork (dry stout), Leg of Ordinary Biters (ordinary bitter), Patrick Henry Pale Ale, Amber Socks Red Ale, Roswell IPA and Pharming Polly — a 10-gallon (38-L) stovetop recipe for a Scottish 70/- ale. Previous recipes formulated this way include: Colby House Porter, Fimbulvinter Øl (winter warmer), Beelzeboss (“witbier” brewed with Mt. Dew), and “Freya’s” Eyes (golden ale). This recipe is given for brewers using a 2-gallon (~8-L) beverage cooler as a mash/lauter tun. 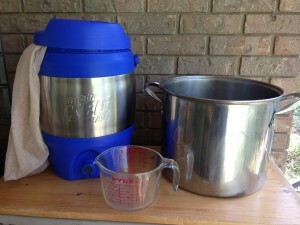 An option is given for mashing more grains in a 3-gallon (11-L) cooler. There’s also an option to make the double dry-hopped version of this beer. This is the last revamped recipe I’ll post for awhile. Going forward, I’ll post countertop partial mash versions of recipes, if people are interested. 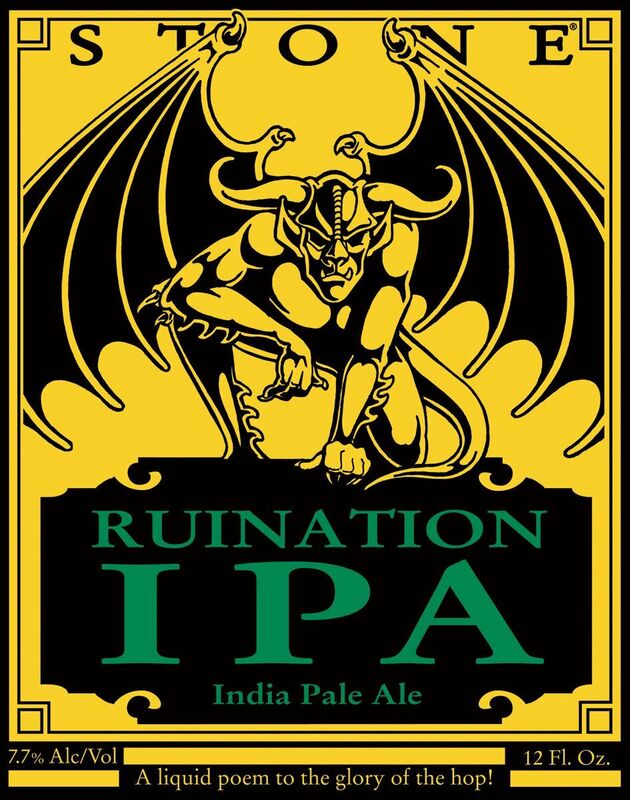 Described by Stone as, “A liquid poem to the glory of the hop,” Ruination is big, hoppy double IPA with a huge hop aroma. Stone has also released Ruination in a few Double Dry Hopped versions. Here are some of the beer stories that made news last week. 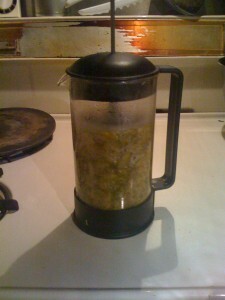 A 1 L French press can be used to make a hop oil extract. Adding hops to the fermenter lets you bypass the boil and fermentation so the volatile oils that give beer their wonderful hop aroma won’t be vaporized by heat or expelled by the outgassing during fermentation. In a previous article, I discussed dry hopping. In this article, I’ll discuss making a homemade extract of hop oils and adding it to your beer. Adding hops to the fermenter is a great way too infuse your beer with aroma from the hop oils. Unlike oils extracted during the boil, oils added post-fermentation won’t be vaporized by heat or expelled by the outgassing of fermentation. 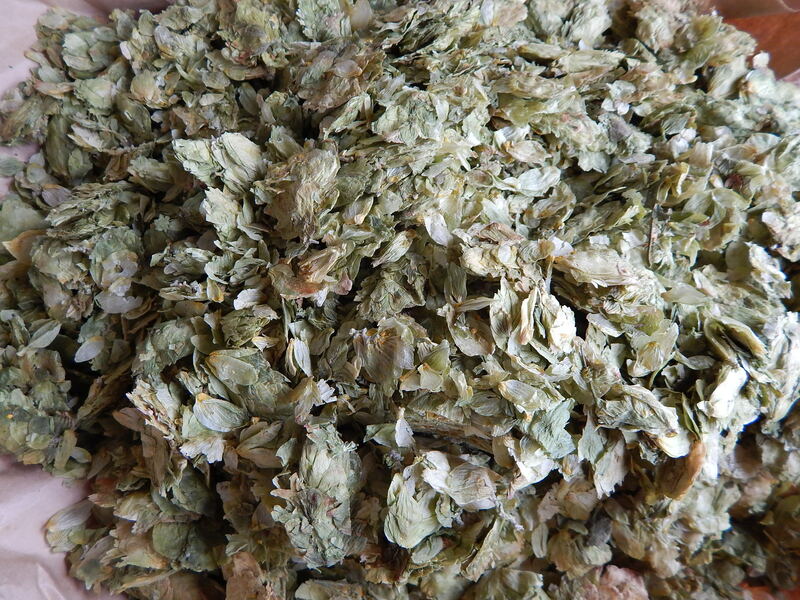 There are two ways to boost your hop aroma by adding oils in the fermenter — dry hopping and adding an aroma extract. In this article, I’ll discuss dry hopping. In the next — which I’ll post later today — I’ll discuss making a homemade extract of hop oils and adding it to your beer.